Originally launched in 2009, the Mitsubishi XD90U was a powerful XGA projector, ideally suited for business and classroom environments. It was priced in the mid-range for XGA projectors, starting at $2995. And for the price, the XD90U didn’t deliver an impressive spec sheet or features: There was no built-in audio, connections were limited, and the brightness output was just acceptable. The projector did a few things right. For one, it was extremely lightweight and portable, weighing just 3 pounds. That’s considered great even by today’s standards. Plus, the images it projected were above average, with only a few limitations. And finally, the XD90U’s lamp performed well, lasting well over 2,000 hours. Today, the projector – and Mitsubishi – is no longer in production. Yet, a reasonably priced used or overseas model might be great for at-home entertainment or classroom and business presentations. The best features of the XD90U: Impressive portability, above-average image quality, decent lamp life, and acceptable brightness. Portability: At 3 pounds, the XD90U was super lightweight, making it ideal for portable home entertainment and multi-classroom presentations. Additionally, it measured about the size of a hardcover book, upping its portability. One limitation: It didn’t have lens shift capabilities, making this more difficult to fit to a specific screen. Image Quality: Overall, with an output of 1,500 lumens, the XD90U’s images were bright and for the untrained eye, they would look crisp and clear. But with larger images, and in environments with ambient light, the details started to wash out and small text wasn’t clear. Lamp Life: For an XGA projector released in 2009, the XD90U received average lamp life. The projector’s bulb was rated at 2,000 hours, which, although it would be considered below average today, was about par for the course at the time. Fortunately, the cost of maintenance is affordable. A replacement lamp for the Mitsubishi XD90U which is also known as part number VLT-XD90LP starts around $300. So you see there were things to like about the XD90U, but what were the limitations? Mitsubishi Is No More: For one, Mitsubishi has dropped out of the projector market. This doesn’t reflect on the projector, but rather, it can make finding replacement hardware more difficult to locate. Fortunately, XD90U replacement bulbs are easy to find; but switches, power cords and circuits can be a challenge to track down. No Sound or 3D: The XD90U didn’t have built-in sound or 3D capabilities. The lack of sound limits its use as a portable projector. 3D though is more of a concern for home video viewers; it’s not usually an issue for business and classroom presentations. Limited Connections: There is no HDMI or USB port on the XD90U. That severely limits its capabilities, especially for those looking to hook this projector up to a Blu-ray or DVD player. Overall, the XD90U does provide a range of useful features. But today, some of the technology seems dated. 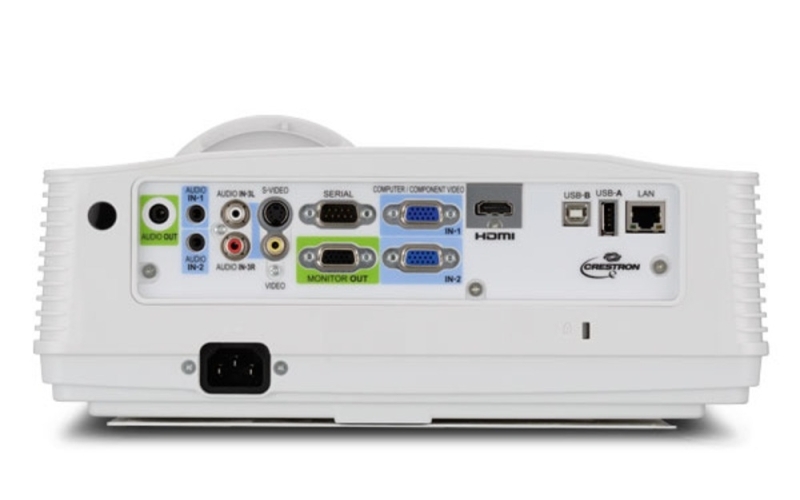 On the used market, it might be an ideal solution as a secondary TV-only projector, or for business presentations on a budget. But the price must be right. For a projector launched all the way back in 2003, the Mitsubishi XD50U did a lot of things well. Originally designed as a relatively high end home theater projector that was ultral light and portable, the XD50U came equipped with high components and it is the main reason why buyers have held on to them so long. The lightweight (just 3.4 pounds) projector delivered sharp, bright images, useful long-life from its 150-watt lamp, and it had a decent set of features. Of course, more than a decade later, the technology is certainly dated: like its lack of USB input or HDMI, boxy housing and in-efficient cooling system. The XD50U has been out-of-production for nearly a decade, but many still use the projector as a secondary set-up. That makes sense: it’s a lightweight, useful piece of A/V hardware that delivers crisp, clear images. Plus, a used XD50U – which is a bit of a rarity to find – starts in the sub-$400 range. In other words, this is a useful projector that would certainly complement your existing hardware. Portability and Install Flexibility: For starters, the projector weighs just about 4 pounds. This was designed to be used for mobile presentations, making it an ideal business projector. Plus, the projectors dimensions are just about the size of a dictionary. Plus, it has a decent digital zoom and vertical keystone correction, making it easier to fit the image to the screen. Superior Image Quality: The XD50U’s best quality: It produced detailed, high-quality images. It did have issues with color accuracy, with was a common complaint of early-2000s DLP-based projectors. Yet, the projector also delivered smooth moving pictures and the color temperatures were right on the mark. Weak Audio Output: The projector was equipped with just a half-watt mono-speaker that delivered weak audio. That output wouldn’t compete in a noisy environment. Average Lamp Output: The XD50U’s 1,500-lumen output was decent, providing bright images that would ideal for rooms with even average ambient light. Yet, the projector’s output, today, would be considered below average. The lamp part number is known as VLT-XD50LP. Limited Connections: In 2003, HMDI was still to be developed; it wasn’t sold until late 2003. USB wasn’t as ubiquitous either. Yet, even so, the XD50U features a fairly weak line of connections. One feature that was innovative at the time was its CompactFlash card reader, which today sounds a little dated. Looking for a replacement lamp for the Mitsubishi XD50U? MyProjectorLamps.com has you covered. We offer the best prices on XD50U replacement lamps, guarantee fast shipping throughout North America, and we offer only OEM-quality original lamps. There are dozens of portable, ultra-short throw projectors available these days. Yet, there was a time when finding an ultra-short throw projector that was also portable was near impossible. The Mitsubishi WD380U-EST was one of the first available with an ultra-short throw, that was packaged in a lightweight body. It quickly became a popular, modestly priced projector for business and classroom audiences. The interest in the projector made sense too. It had an ultra-short throw. The projector is capable of displaying a 100-inch image from just 30 inches away. Plus, the projector had a feature-set that was rare for budget-friendly projectors. The Mitsubishi WD380U-EST was equipped with robust wireless connectivity, an HDMI port, a USB-A port, a capable 10-watt speaker, and PC 3D compatibility. And at 9 pounds, it was a projector you could take anywhere. Today, not only is the WD380U out of production, Mitsubishi itself exited the projector market in 2013. Even so, the WD380U – and also the WD390U, which was released two years later – remains a highly capable ultra-short throw projector. Image quality, portability, and throw-range are ideal for uses, and the feature sets compares to what you’ll find in similarly priced UST projectors today. Through third-party resellers, the WD380U can be hard to find, but the replacement WD390U, which shares a majority of features with the earlier model, is still available. If you need a portable, UST projector, the WD-380U or WD390U should garner your attention. Brightness and Contrast: The WD380U’s lamp delivered up to 2,800 lumens of brightness with a 3,000:1 contrast ratio. Plus, the brightness was adaptable. In the Whiteboard mode, the projector adjusted output to match a makeshift screen like a whiteboard or blackboard. Even in these applications, brightness remained at about 1,500 lumens. Plus, in Presentation mode, which was designed to project black-and-white images, images were crisp, clear and easy to read. The WD390U received a slight boost in output: an even 3,000 lumens of brightness. Long Lamp Life: The WD-380 is equipped with a 230-watt lamp that has been optimized for maximum life. In standard operating mode, the lamp has a life of 3,000 hours – about average for similar DLP-based projectors – and it boosts up to 6,000 hours in economy mode. Fortunately, a replacement lamp for the Mitsubishi WD380U remains affordable. The replacement part (No. VLT-XD560LP) starts just north of $200. Easy Setup, User Friendly Controls: One reason the WD380U is so portable is that it remains super easy to install. Essentially, it’s a plug-and-play projector. That makes this projector useful as a cart installed projector. Plus, it requires little-to-no calibration before installation, and the controls are easy enough that anyone can use them. Built-In Audio: The 380U’s built-in 10-watt speaker provides decent output for classroom and business environments. Yet, even more useful is the projector’s audio mixing capabilities. The projector enables users to mix audio from two different sources. So for instance, a presenter could show a video, while using a wireless microphone to provide commentary. Even today, that remains a fairly unique option for budget- and mid-range projectors. A Range of Connections: The WD380U is equipped with a variety of ports, including an HDMI link, S-Video, two VGA connections, and both a USB-A and B port. The USB A connection makes it possible to display content directly from a USB drive. Plus, the projector has great wireless networking options, including the ability to pull content from a remotely-connected desktop computer. So what’s the bottom line? Even though Mitsubishi no longer makes projectors, the WD380U remains an intriguing option for smaller spaces. Plus, the features are extremely useful. If you can find the WD380U as a refurbished or new option from a third-party reseller, this will provide a ton of functionality at a fairly economical price.